This is a post that I had intended to publish between Christmas and new year, but I took a well-deserved blogging break instead. 2017 was the year of theatre for me. It’s the year I discovered that theatre blogging was actually a thing, and I regret not getting into it sooner. Compared to a lot of theatre bloggers, I didn’t go to that many shows in 2017 and I’m also too indecisive to choose my top shows from last year. Instead, I’m sharing my top 5 theatre moments from last year. But in no particular order, because…well, indecisive. The only reason I went to see Dreamgirls in the summer was because I was a big Glee fan and Amber Riley was in the starring role. I had never watched the film and didn’t know much about the plot. I simply bought a cheap ticket (for a pretty good seat actually) and went along on a ridiculously hot June afternoon. And I was not disappointed! Until this moment, I had never seen a standing ovation at the end of the first act but Amber got one. People around me were crying and I’m going to be honest, it’s the only time I’ve felt the need to cheer whilst in the theatre. You don’t quite get the same effect watching her Olivier performance, but it’s the closest you’ll get if you didn’t get to see her in the flesh as she left a couple of months ago. I would 100% buy a ticket to see her perform this again; it was breathtaking. In July, I was invited to see my first ever show as a member of the press. Whilst Our Ladies of Perpetual Succour wasn’t my first choice of shows, I was blown away. I even got to pop backstage to the green room to interview the cast. All from this little blog! I’ve been to see a few other shows on press tickets since then and one of my 2018 goals is to get invited to more. I love being able to share my love of theatre with you guys and it’s a brilliant way for me to see shows that are out of my comfort zone. Two of my big theatre goals have always been to attend a big West End press night (I so wish I could’ve been at the Hamilton one last month) and to go to a closing night performance. After falling in love with Charlie Stemp’s portrayal of Arthur Kipps in Half A Sixpence in June, I snapped up a ticket to the closing night in September. Whilst the cheering was all a bit much for me initially, I got used to it and had a ball. I was even able to see Cameron Mackintosh in the flesh from way up in the balcony. I could definitely get used to attending more closing night performances, and I have half a mind to go to An American In Paris‘ this weekend. Sure, it wasn’t my favourite show of 2017, but I wouldn’t mind saying goodbye to it. Until August, I had never travelled further north than the Lake District. I was invited to see An Act Of Kindness during its London preview, but after not being able to attend I was asked if I’d like to see it in Edinburgh. Without this opportunity, I probably never would’ve taken the trip and have a wonderful day out in the Scottish capital. I thoroughly enjoyed the show too and I’ll definitely be looking out for more works from Rascal Theatre this year. Smaller companies put on some incredible productions and I am definitely going to look into more independent work. Whilst wandering about the West End in June, I took my usual shortcut between the Wyndham’s and Noel Coward Theatres’ stage doors. As I was walking through, I saw Audra McDonald and just had to ask for a photo and practically promised her I’d see Lady Day At Emerson’s Bar & Grill. A few weeks later I decided I had to see the show and I was blown away. There’s a reason that Audra is the most decorated actress in Broadway history! I had a blast being able to blog about theatre in 2017, and I can’t wait to continue to do so into 2018. This year I’m aiming to review a minimum of 24 shows across a variety of genres. I’m also hoping to engage with more theatre bloggers in 2018. 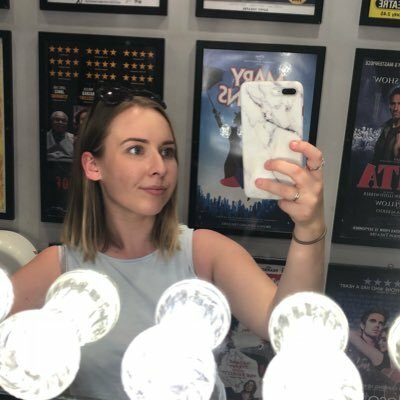 Most of my blogging friends are based up north and blog beauty, but I’m also looking for more friends down south who I can talk to theatre about. Theatre is here to stay and I’m so excited! And maybe my top theatre moments will be a little more exciting next year.